Step back in time and experience life in colonial America with a visit to historic Williamsburg, Virginia. More than just a city, it is a recreation of life as it once was during some of the most formative years of our nation’s history, with all details carefully curated to make for one of the country’s most impressive living-history museums. Buildings are a mix of original and reconstructed buildings built between the 17th and 19th centuries, city guides dress in era-appropriate clothing and speak with colonial grammar and diction, and horse-drawn carriages make their way down the pedestrian thoroughfares. Stories of brave individuals and groundbreaking events are recalled through guided and self-guided visits to Colonial Williamsburg, which help to paint a more vivid picture of this period in history. With more than 50 sites to visit within the city that include merchant shops, government buildings, religious sites, public gathering spots, there are countless opportunities for learning. Religion was one of the key ideals that guided the formation of the colonies, and its influence is present in many of Colonial Williamsburg’s historic sites. 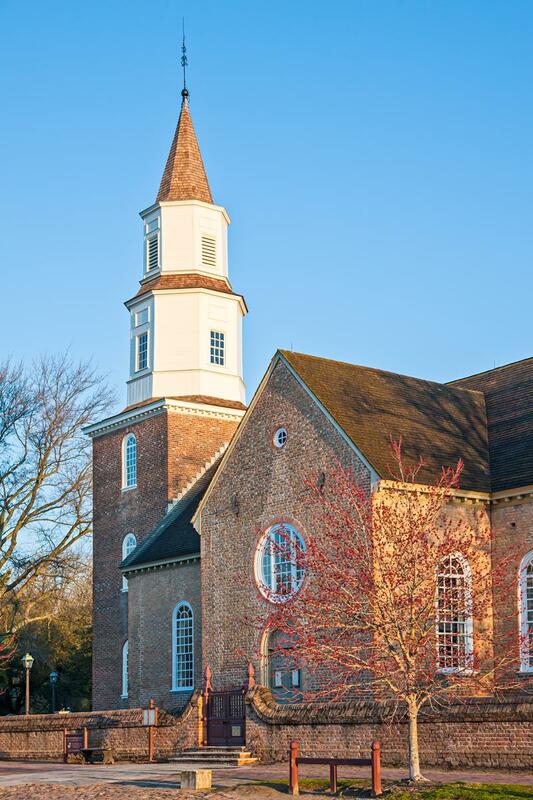 Check out the Bruton Parish Church, an episcopal church that is now three centuries old, completed in 1715. During Revolutionary times, the Church of England was the official church that all Virginians were expected to attend regularly. It was at this site that many famous patriots attended worship services, and it still plays an active role in the local community. Attend a Sunday services, an evening, candle-lit concert or plan on a self-guided tour where knowledgeable volunteers are on hand to answer your questions. During colonial times, it was the Anglican Church that served as the only official religion. Although Catholics and other non-Protestants were denied religious freedom, the government allowed many non-Protestants to worship in meetinghouses like Williamsburg’s Presbyterian Meeting House. Explore the inside as it would have been hundreds of years ago to all those who entered. African-American religion as well played an important role during life in colonial times and visitors can pay a visit to a local home where a self-guided tour will allow for greater insight into the religious heritage of Africans and their Virginia descendants. And just across the street from the home is a plaque that marks the original site where African-American Baptists met. 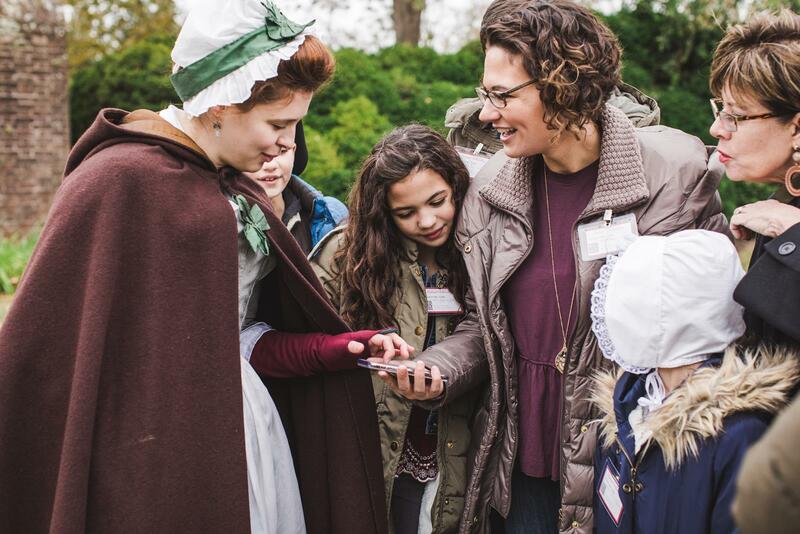 During a visit to Colonial Williamsburg, guests will have the chance to meet interpreters who get into character to tell the story of incredible Americans who helped shape our country as we know it today. Check out the calendar before your visit to see who will be on hand. Step into the past with Gowan Pamphlet, a revolutionary Baptist preacher whose story of perseverance and drive will serve as an example for generations to come. Pamphlet was once an enslaved tavern worker but went on to found an all-black Baptist church. Meet Mr. Pamphlet as he recounts the remarkable events that took place during this time. Ann Wager is another individual whose story comes to life in Colonial Williamsburg, and it is a story that exemplifies the spirit of nation-building. Wager was the teacher of the first official school for African Americans in Virginia, a role that was both controversial and contradictory. Mrs. Wager shares a breadth of knowledge related to education, religion, slavery, and life as a businesswoman in colonial times. The unique draw of Colonial Williamsburg is that it is more than just a museum. It is a way to travel back in time and see the smallest of details as they were during the colonial era. Every day there are interactive events that allow visitors to take part in experiences that are otherwise rarely a part of our modern world. Stroll through the quaint car-free streets, take a carriage ride, shoot a musket, participate in a local court session, or visit the local silversmith shop. Colonial Williamsburg is a place for all interests and for all ages, and there is no shortage of learning and fun to be had at any time of year. While exploring Colonial Williamsburg on foot is easy and detailed maps provided online and at the visitor center will keep you on the right track, guided tours provide an extra layer of knowledge that you won’t get anywhere else. There are more than 20 to choose from, all of which are included in admission tickets, including a behind-the-scenes tour, a children’s visit of the Governor’s Palace, a meet-and-greet with some of Colonial Williamsburg’s animals at the stables, or a haunted walking tour after dark. Of course, these are just a few of the many exciting tours taking place each day. Be sure to check the calendar when you arrive to see what adventures await.